“I have been purchasing a number of kits from you over the last six months and I thought that you might like to see a couple of the finished rooms. 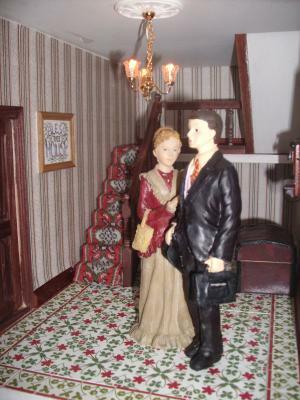 The first one is the hallway staircarpet using the red colourway of “Amy”. Because of the size of the staircase I stitched a simpler border so that I could bring it in a little at the sides. I also substituted some of the blue colours for green wool that I had left over from another of your carpets, so that this lower staircarpet would blend better with the tiled flooring – the rest of the carpets use the blue wool. I have six flights of stairs in the house and am still stitching flight number five. 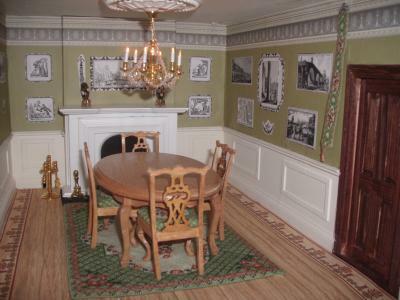 “The second photo is of the dining room, where I have included the “Barbara” carpet, four chairs and the bellpull. It is my favourite room so far, and the one of which I am most proud. Although the overall theme of the house is late Victorian, I based this room on the Georgian print rooms at the great Irish Houses of Castletown and Carton.